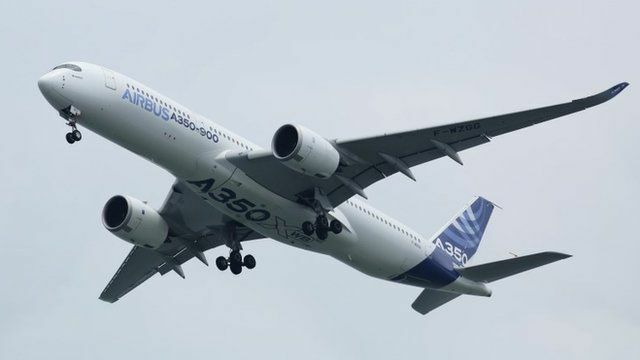 High demand delays new plane delivery Jump to media player Airbus has announced a revamp of its popular A330 passenger jet on the opening day of the Farnborough Airshow. What might aircraft of the future do? Jump to media player The BBC's Mark Edwardson talks to BAE Systems about technology of the future which could be used in aircraft within a generation. US Navy debuts the P-8A Poseidon Jump to media player Flight Sergeant David Miles, explains to the BBC why the US Navy's P-8A Poseidon is a little bit different from the Boeing 737/800, which it is based on. Bell tries to woo buyers for Osprey Jump to media player Bell Helicopters takes its V-22 Osprey military aircraft to the Singapore Air Show in the hope of finding new customers. Airbus has announced a revamp of its popular A330 passenger jet on the opening day of the Farnborough Airshow. It comes as both Airbus and Boeing battle with their biggest ever backlog of undelivered planes. Go to next video: What might aircraft of the future do?